"Begin anywhere. Stop anywhere. Everything that can possibly be written now is a drop of rain upon its vast syncretic ocean... This future of our shared media Byzantium is obscenely bright." 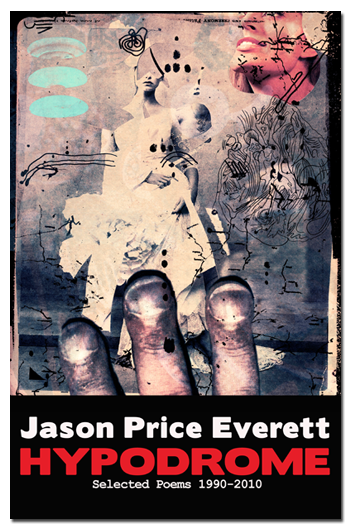 Jason Price Everett's poetry explodes from the page with the raucous power of industrial machinery and strikes its targets with the rapier's fine point. Honing in on the chaos of the past two decades, Hypodrome charts the growth of today's artist searching for the defining aesthetic of our time. These poems document the plastic, the losses, the frustrations and the triumphs accumulated during the course of an accelerated era, set against the backdrop of an ominously beautiful future. SELECTED POEMS 1990-2010 "Begin anywhere. Stop anywhere. Everything that can possibly be written now is a drop of rain upon its vast syncretic ocean. The interior of this network is the ur -Art: permanent and all-devouring until the power goes out. A universal forced collaboration consuming the individual artist, drowning out spirit and talent alike against the background tone, incorporating everything that can be communicated into that which we do not have a name for yet, as art. Self-induced personalized sequences of aesthetic meaning – arranged at will. Incorporeal tesserae for the personalized mosaic of a deity. This future of our shared media Byzantium is obscenely bright."